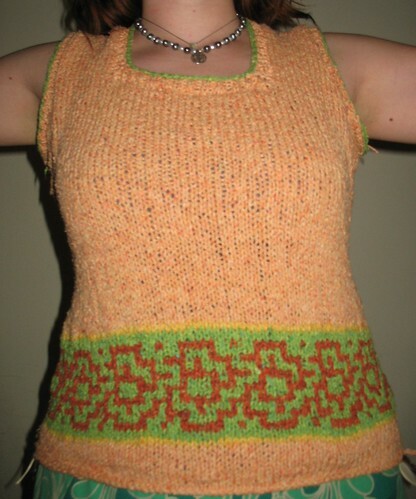 So, I saw the Elinor tank in this summer's Interweave and loved it. As it happened I had picked up some Rowan Summer Tweed at MD Sheep and Wool, so it seemed meant. My original plan had been to shift the mosaic strip up, but I wanted to wait until after the shaping, so it ended up not shifting that much. I had some fun beads that I used. This was really quick knit and a lot of fun. Amazingly, I think I knit it as written. 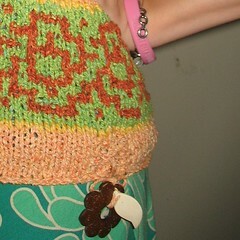 I also thinks this officially makes Wendy Bernard the person who's design I knit most frequently. Hmmm. And she has a book coming out.. I really like the bright summery colors!